With a new year starting most people are starting to think about what new updates they want to do in their home. For most of us, a dream kitchen has always been in the back of our head. Designing a kitchen can be an overwhelming thought, especially because there are so many trends it’s hard to know which ones are here to stay and if you put them in your kitchen if you will regret them in a few months time. When thinking of your dream kitchen the best place to start is with design and convenience. Here are a few of the dream kitchen must have’s and why they’re some of the trends that are here to stay. This is an important feature to include because it lets you put away the clutter that would fill up your countertops. People are buying more and more kitchen appliances, from the popular Kitchen Aid Mixer’s to espresso machines, to air fryers and everything in between. It’s endless. This is why if you have a designated spot to hide all of these, you will still have space to cook and keep a clean and organized kitchen. Storage is always top of mind for people when they are thinking about remodeling their kitchen. Especially for families or couples starting to think about a family, it’s a common problem not to have enough space for food/snack storage. You are able to spread out your food/ingredients which makes cooking and the preparation that goes into a meal that much easier. If you are the type of person who loses things like sugar or flour, having everything spread out in one place will eliminate that problem as well. 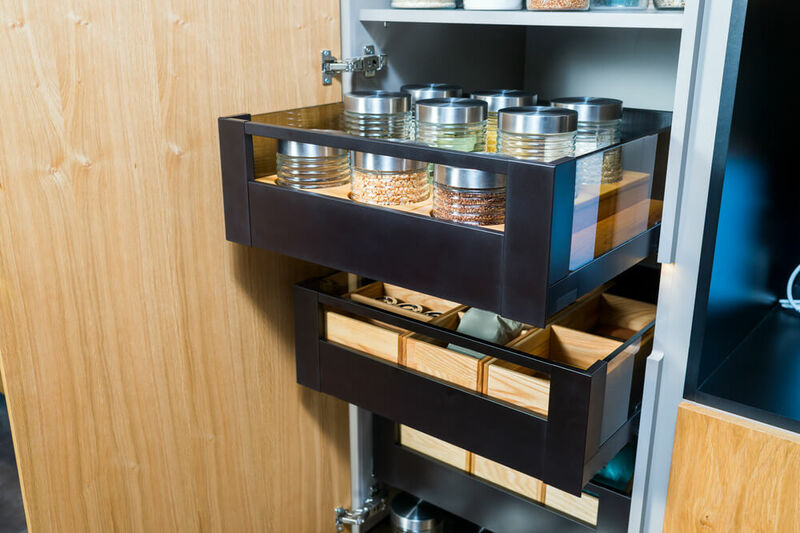 Including pull out shelves/drawers makes it very convenient to use all possible storage in your cabinets. If you have trouble reaching back into deep cabinets and still being able to keep them neat/tidy this will help you with both problems. You can also add these on deep and narrow places you are stumped with ways to utilize the space. This is a great option for baking sheets/cupcake pans. This type of lighting is great because it’s installed directly under your cabinets and you can’t see it. This will add not only depth to your kitchen but you are able to get more light in places that were once hard to light up. They are one of the less expensive upgrades you can add to a kitchen to help give it a different feel to it. If you are ready to start planning and designing your kitchen remodel, you can view our past projects on our website. Turn to the kitchen remodeling experts at The Kitchen Center Of Framingham to make sure you are creating a dream kitchen you will enjoy for years to come. For questions or to get started, you can contact us at 508-875-4004 or online via our website. We can’t wait to see the final product!